It took me about a month to run the vacuum. I couldn't bear to vanquish all the stray Jeffie hair. There's still a spot that hasn't seen the vac. Just a little slice between the bed and the window wall in my office. It's where Jeffie liked to nap stretched out. There he could easily keep an eye on me, yet be handy to the window and his security duties. I'd often glance over and see him watching me. If something upset me while I was working, he'd immediately come over, put a paw on my knee and rest his head against my arm. After comforting me or making me laugh, he'd head back to his spot. It's full of Jeffie hair. On the carpet. Stuck to the wall. Clinging to the bed's dust ruffle. Today marks 6 months since Jeffie died in my arms.from Leptospirosis. When I awake each morning there is no longer a soft furry head sharing my pillow. 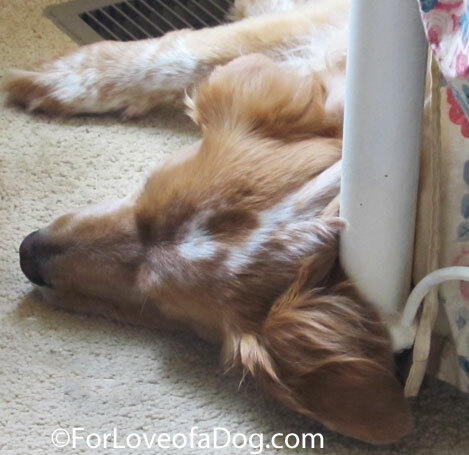 As I head to the kitchen to grab a cup of coffee there is no doggy head pressed on the outside of my right knee. As I dish up the dogs' breakfast, there is no longer a pup who can't contain a little woof of excitement. In fact, there is a whole lot of silence in my house. No one barks at the UPS and FedEx guys. No longer does anyone care that the trash service is stealing our trash. Coyotes in the pasture? The current crew just watches. Not only is there a hole in my heart, but there is a very large hole in my life where Jeffie used to be. By my side and with me like an extra limb. I know. I know. I cannot collect enough of the fur Jeffie left behind ... but sometimes wild hope, though bittersweet, can be a joyful thing. Mom Kim here - I am so very sorry that your Jeffie left you - it is never easy when one of our furry companions die. You two were so fortunate though I am sure it was painful for you, to be together at the end. Although no one will ever know the exact pain that is felt by any other individual when they experience a loss, everyone who has ever lost a loved one - human or animal - knows the pain of loss. I know that recent pain of a lost furry family member - Angel Shiloh in March of this year. 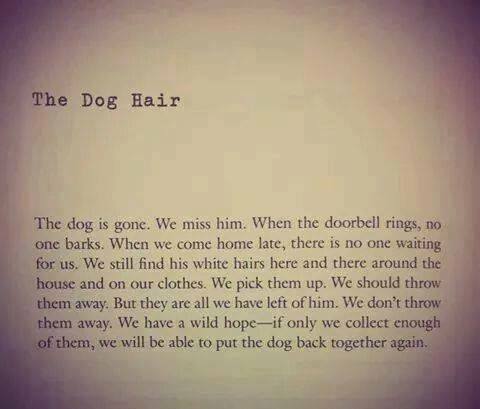 I am finding out through pain that he was my heart dog - something I never totally realized while he was with me. Lady Shasta tries to fill that hole the best she can but she is not nor will she ever fill it as good as him. Besides, I have had to work with her to help her get through her own grief - a process that has been painful for us both but we have grown closer because of it. For a couple of weeks she would not even go out and explore/patrol the backyard looking for unwanted intruders - I had to lure her around with treats. I can tell she still has her moments when she sits on the deck looking for him. And I can tell she still misses the companionship of another furry body - she recently made FRIENDS with a CAT - something she never would have done with her brother around. I am in the process of trying to pack up things in the house to get ready to sell my house - for some reason, even packing things that are not his I find this difficult to do and brings back memories of him. I find it difficult to blog at times because he was such a major part of it but then I feel like I am slighting Lady Shasta when I don't blog. I pray that someday there will be more happy times for you when you think of Jeffie - go ahead, save some of those Jeffie hairs - being so crafty maybe you can make them into something, maybe some kind of jewelry - something really good. PS - I was wondering something - is there a chance your other dogs would still be grieving a little - or were they never close to Jeffie? Just a thought. I so much sympathize with your loss. Rudy and Rosie definitely have grieved for Jeffie and it is very clear that Rudy still misses him. A few years back when Tucker was diagnosed with brain cancer and was very ill, Rudy was just a puppy and sat vigil with him. It was very sweet and heartbreaking. He still visits Tucker and Lucy's graves. Oh, Jeffie. We miss him too - his gorgeous face and that little heart on his forehead. Such a sweet boy. They leave such a huge hole when they go. Sending hugs. Thanks, Jackie. He just was a huge presence in my life :-) And... I owe you a seriously overdue email! Aw, Caren, thank you so much. I always called him my beautiful boy :-) Ironic that my blog is Talking Dogs because Rudy and Rosie are very silent! I'm so sorry. My mom still mourns her Trine from over 11 years ago. Some dogs are more special than others too. Save his hair, leave it on the floor too. You will know when it is time to vacuum it all up. He was a wonderful boy. I have saved the hair (put it in his urn) and I have not vacuumed. Rudy sometimes goes to the spot and sniffs and sniffs. He never lays there. I'm so sorry my friend. It will never, truly go away. I wish I had something to say to help ease the hurt in your heart. My heart goes out to you. I do Cary a bit of Jasmine's living fur in a pendant around my neck. She really loved her cooling bed - for a longest time I couldn't stand anybody else on it because it still had some of her smell. I sleep under a sleeping bag she had on her other bed and even though it could really use cleaning I don't know if I can. Well, the truth is that I also have not cleaned Jeffie's favorite dog bed. It's still right beside the bed. In all this time Rudy has slept in it twice. Rosie examines it, but never gets in it. Thanks, Bren. Like I told Jodi, it really isn't all gloom and doom mourning around here. Lots of happy memories to enjoy, too. 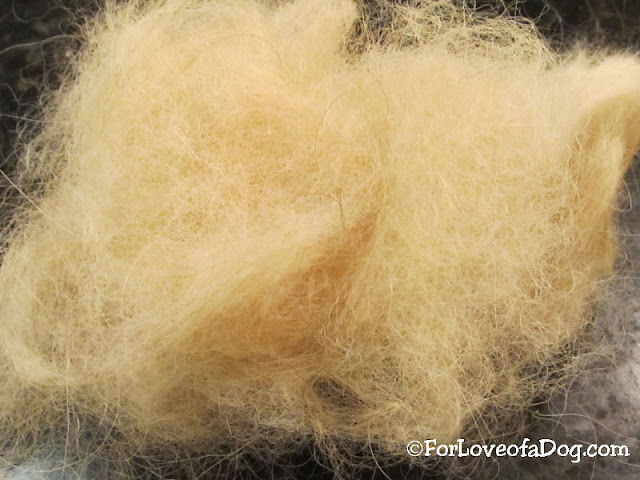 I have an envelope full of my first cat's Danny's fur, I took it from his brush, he's been gone since 1993. It's so hard losing a pet I've certainly been there before and I feel your pain and loss. I wish there was a magic wand to wave that would help you heal. My heart to goes out to you, what a touching post! I can't say it gets easier it just gets different. Lovely song too! Different, for sure. I like to think of him with my other dogs that have "crossed the bridge" - some he knew and some he didn't. :-) The fur is still there. I wasn't going to write this because, truly, there are so many happy memories. However, sometimes when I least expect it something will happen and it's just pain all over again. Sort of rips the bandaid off. I still miss Lucy terribly, as well as Jeffie. In my life these were the two dogs who really were like another limb. I know exactly what you mean about avoiding triggers. Yep.